For the past four weeks I have been in beautiful Wellington, New Zealand, where I have the extraordinary privilege of participating in “Entrenchments 2015”, a commemorative project at Victoria University of Wellington. “Entrenchments” is an initiative of Dr. Marco Sonzogni, the Director of the New Zealand Centre for Literary Translation, and of Dr. Sydney Shep, Director of the University’s Wai-te-Ata Press. 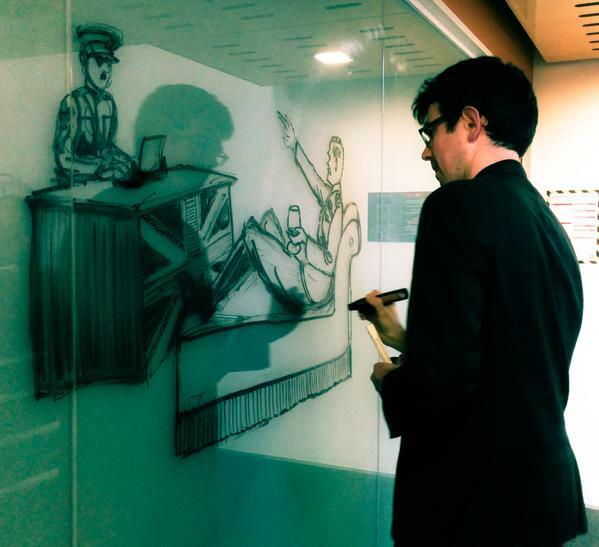 Along with the New Zealand author and graphic artist Sarah Laing, I was invited to create visual responses to texts originating from or dealing with the First and Second World Wars. My residency here (funded by the Canadian High Commission of New Zealand) includes the creation of comic-strip versions of John McCrae’s celebrated 1915 poem “In Flanders Fields” and of a poem by New Zealand’s current Poet Laureate, Vincent O’Sullivan, specially written for “Entrenchments”, which offers a poignant and witty reflection on the commemorative rhetoric surrounding WWI. A few days ago, Marco, Sydney, Sarah and I were interviewed by Sonia Sly of Radio New Zealand on the subject of this exciting project, which you can listen to here: http://www.radionz.co.nz/national/programmes/standing-room-only/audio/201752020/entrenchments-2015 In addition to the comic adaptations, I am also involved in the creation of the “daily dispatches”, a fifteen-minute live “visual response” to a daily twitter feed associated with New Zealand’s WW100 project which tweets out entries from the wartime diary of Lt. Col. William George Malone, the commander of the Wellington Battalion of the New Zealand Expeditionary Force during the Gallipoli campaign of 1915. 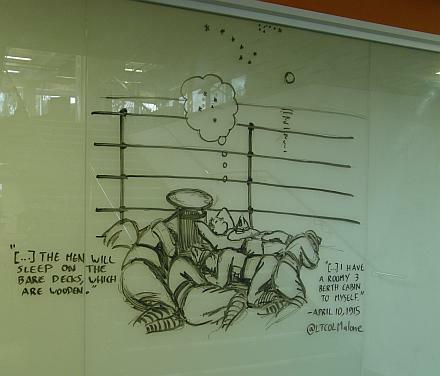 Below are some examples of these daily drawings, which I have about an hour to conceive and prepare, and which are then drawn in whiteboard marker on a glass panel in front of a live audience and a stop motion camera. Don’t judge me too harshly on them -They’re drawn under high pressure conditions! But it’s great fun. You can see all the drawings on twitter at #joinjulian. 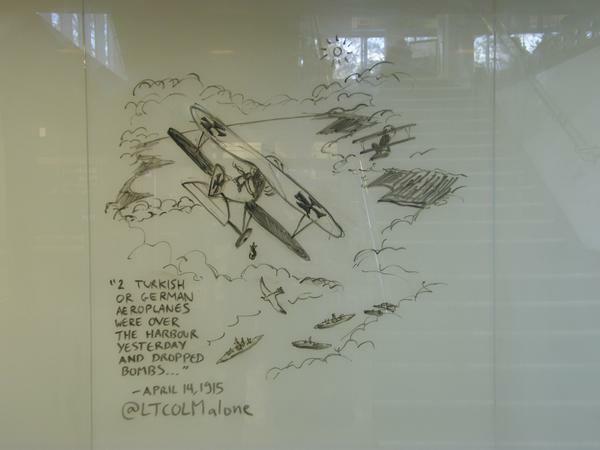 This entry was posted in comic book poetry, illustration, marco sonzogni, new zealand centre for literary translation, Poetry translation, victoria university wellington, World War One and tagged entrenchments 2015, gallipoli, in flanders fields, john mccrae, marco sonzogni, radio new zealnd, sarah laing, sonia sly, sydney shep, vincent o'sullivan, wai-te-ata press, william george malone. Bookmark the permalink.